A Review of the Tom Bihn Aeronaut 45 Carry-On Bag. Savvy travelers are always on the hunt for a compact carry-on bag that fits within the overhead bin size restrictions but can pack enough clothing for an extended trip. As most airlines charge added fees for checked luggage, it makes sense for regular travelers to purchase a carry-on option to use for shorter excursions. 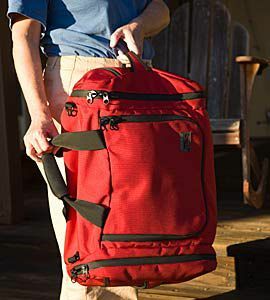 Founded in Santa Cruz, California in 1982, Tom Bihn has offered a variety of travel gear for over 30 years, and their Aeronaut 45 bag is a long-time favorite among minimalist adventurers. The Aeronaut 45 is a soft-sided bag that can be configured to be carried as backpack, shoulder bag or duffle. The inside compartments are adjustable, allowing for the maximum flexbility in packing options. The Aeronaut is much lighter than a rolling bag. Multiple handles make getting it off luggage racks easy. Durable: Built to last with water-shedding covered zippers. The Tom Bihn Aeronaut is not cheap; the retail price is $300.00. This is a well-designed bag using top materials. It's made to last, which is a good thing considering the price. But then again, good stuff doesn't come cheap. Concealed straps pull out to convert the bag into a backpack. They're easy to extract and set up, and the pack is comfortable to carry on your back. The bag has three handles. The primary padded one is for normal carrying like a suitcase, but then there are two other handles on the ends. These allow you to swing the bag up to the overhead racks and quickly retrieve them without rotating the bag to get at the handle. No matter how you put the bag and how many people jerk it around to get their bags up there, there is always a handle where you can get to it. The two side compartments can be used for shoes, underwear, or dirty clothes, keeping them out of the way. There is easy access to everything in the bag, and you can always manage to shove one more item into it. For help in organizing smaller stuff, the Tom Bihn packing cubes are a nifty add-on. The bag worked as advertised through dry and wet—and still looks new. This carry-on sized got a workout and really earned our respect. The Aeronaut 45 is an extraordinary bag. The Aeronaut comes in two options: heavy-duty 1050 Ballistic nylon with splash-proof YKK #10 Coil zippers and a lighter 400d Halcyon weave model. Total O-rings: 9 (4 in the main compartment, 1 in the inside mesh pocket, 1 in the left curved pocket, 1 in the right curved pocket, 1 in the left side pocket, 1 in the right side pocket). There is an optional and removable 1" / 25 mm waist strap. Meets most non-commuter domestic airlines' carry-on size standards (check first, this standard becoming a moving target). The company offers 14 color options for the bag, including shades of black, blue, and orange.